The pupillary light reflex ([link]) begins when light hits the retina and causes a signal to travel along the optic nerve. This is visual sensation, because the afferent branch of this reflex is simply sharing the special sense pathway. 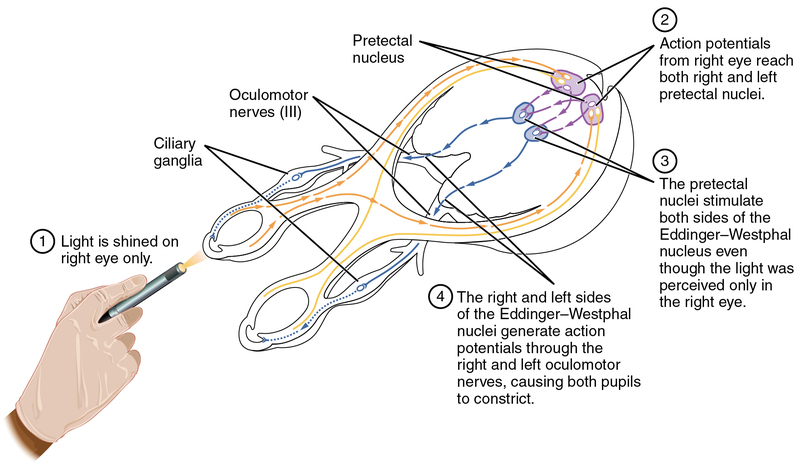 Bright light hitting the retina leads to the parasympathetic response, through the oculomotor nerve, followed by the postganglionic fiber from the ciliary ganglion, which stimulates the circular fibers of the iris to contract and constrict the pupil. When light hits the retina in one eye, both pupils contract. When that light is removed, both pupils dilate again back to the resting position. When the stimulus is unilateral (presented to only one eye), the response is bilateral (both eyes). The same is not true for somatic reflexes. If you touch a hot radiator, you only pull that arm back, not both. Central control of autonomic reflexes is different than for somatic reflexes. The hypothalamus, along with other CNS locations, controls the autonomic system. The pupil is under competing autonomic control in response to light levels hitting the retina. The sympathetic system will dilate the pupil when the retina is not receiving enough light, and the parasympathetic system will constrict the pupil when too much light hits the retina. The hypothalamus then uses this visual system input to drive the pupillary reflexes. If the retina is activated by high levels of light, the hypothalamus stimulates the parasympathetic response. If the optic nerve message shows that low levels of light are falling on the retina, the hypothalamus activates the sympathetic response. 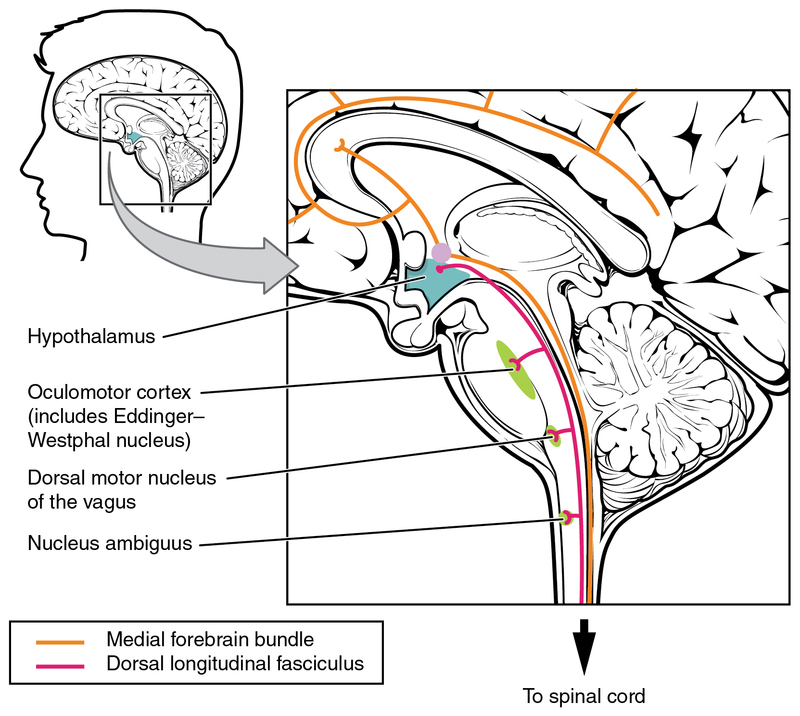 Output from the hypothalamus follows two main tracts, the dorsal longitudinal fasciculus and the medial forebrain bundle ([link]). Along these two tracts, the hypothalamus can influence the Eddinger–Westphal nucleus of the oculomotor complex or the lateral horns of the thoracic spinal cord. The hypothalamus is the source of most of the central control of autonomic function. It receives input from cerebral structures and projects to brain stem and spinal cord structures to regulate the balance of sympathetic and parasympathetic input to the organ systems of the body. The main pathways for this are the medial forebrain bundle and the dorsal longitudinal fasciculus. The amygdala is a group of nuclei in the medial region of the temporal lobe that is part of the limbic lobe ([link]). The limbic lobe includes structures that are involved in emotional responses, as well as structures that contribute to memory function. The limbic lobe has strong connections with the hypothalamus and influences the state of its activity on the basis of emotional state. For example, when you are anxious or scared, the amygdala will send signals to the hypothalamus along the medial forebrain bundle that will stimulate the sympathetic fight-or-flight response. The hypothalamus will also stimulate the release of stress hormones through its control of the endocrine system in response to amygdala input. 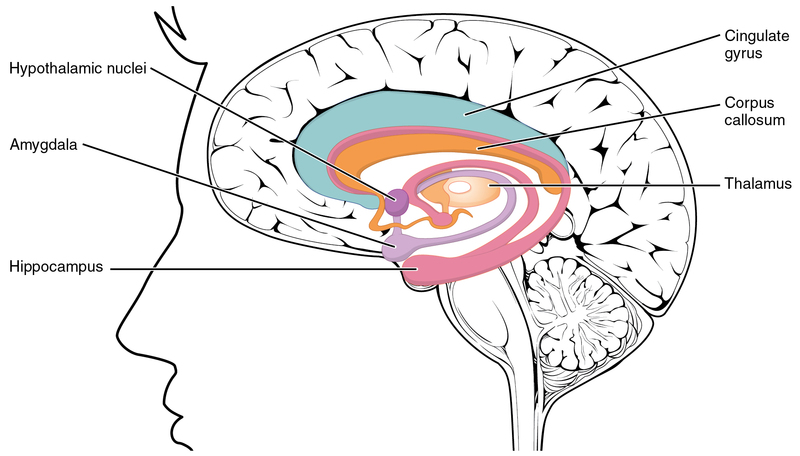 Structures arranged around the edge of the cerebrum constitute the limbic lobe, which includes the amygdala, hippocampus, and cingulate gyrus, and connects to the hypothalamus. Which of these locations in the forebrain is the master control center for homeostasis through the autonomic and endocrine systems? Which nerve projects to the hypothalamus to indicate the level of light stimuli in the retina? What region of the limbic lobe is responsible for generating stress responses via the hypothalamus? What is another name for the preganglionic sympathetic fibers that project to the heart? What central fiber tract connects forebrain and brain stem structures with the hypothalamus? Horner’s syndrome is a condition that presents with changes in one eye, such as pupillary constriction and dropping of eyelids, as well as decreased sweating in the face. Why could a tumor in the thoracic cavity have an effect on these autonomic functions? The cardiovascular center is responsible for regulating the heart and blood vessels through homeostatic mechanisms. What tone does each component of the cardiovascular system have? What connections does the cardiovascular center invoke to keep these two systems in their resting tone? 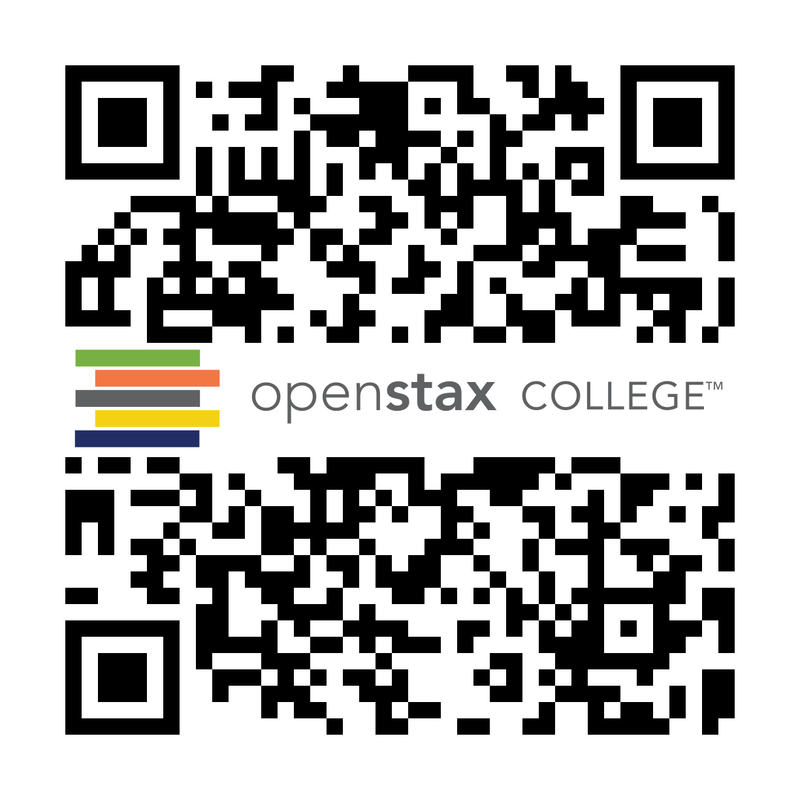 Central Control by OpenStaxCollege is licensed under a Creative Commons Attribution 4.0 International License, except where otherwise noted.